Wagner, aka Outlaw Wagner, is a 2½-year-old blue male born on September 8, 2008. His sire is Trent Lee and his dam is Brown Spider. Wagner is Levi's littermate. There are 25 races to Wagner's credit on Greyhound-data.com, all at Gulf Greyhound Park. His career started on November 19, 2010 and ended with a broken leg on April 30, 2011. He had surgery on his leg on May 6th by Dr. Robert Barstad at the Dallas Veterinary Surgical Center. 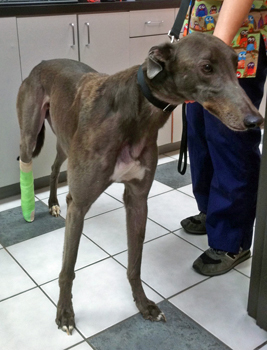 His left central tarsal bone was broken in three pieces, causing a very difficult repair. Two 2.0mm lag screws were used for the reconstruction. During his normal vetting procedures after he got out of his cast, one of Wagner's lymph nodes was found to be reactive and was removed. Wagner has received his medical release from Dr. Christy Soileau of VCA Preston Park Animal Hospital and he is ready to find his forever home! Wagner is not cat tolerant.